It started out as one of those annoying Saturdays where you spend a lot of time driving around doing errands and not a lot of time enjoying it. By 2 in the afternoon we were lost somewhere in Coquitlam in a maze of traffic and construction. Patience was starting to erode, tones were starting to get snappy. And it didn't help that we were both starving. And then, suddenly, we came upon it. 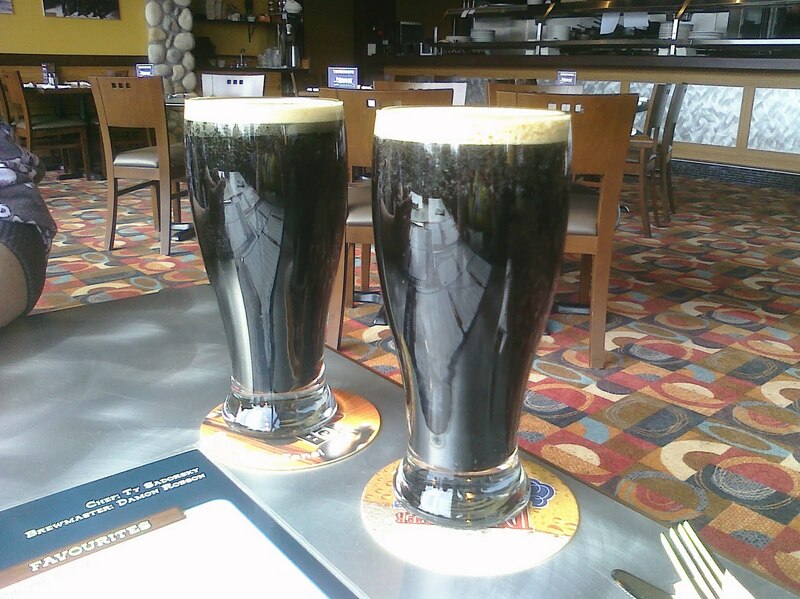 A brewpub - in Coquitlam! Who knew?! And so, moods improving already, we rolled into the parking lot at Big River Brewpub. Although the fact that it was attached to a bowling alley made me doubt its authenticity for a moment, I felt much better when I saw that the brewer's choice pint for the day was a coconut porter. This place had to be legit. I was pleasantly surprised by the coconut porter. I was expecting sweetness, but what I got was a subtle nutty flavour and a smooth, light-tasting porter. It definitely wasn't creamy, but had a nice head on it and went down easy. It was really refreshing! Nice work Big River.We would have loved to try a couple of the other brews, but as it was 2pm and the errand-running wasn't quite finished, we decided we'd save it for another (evening) visit. Later on, errands and a couple hours of gardening finished, I was ready for another. 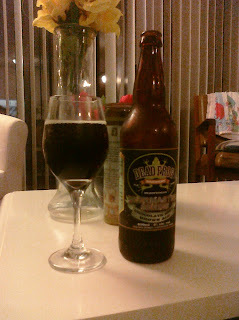 This time, I cracked a bottle of the Dead Frog Brewery Chocolate Mint Brown Ale. I definitely dig this beer. The mint is there in scent, but not overpowering in taste. And same deal for the chocolate. It comes through as part of the overall maltiness, not as a distinct flavour. I had fears of a sickly-sweet peppermint patty kind of flavour, but thankfully it was more like someone added a fresh sprig of mint to a rich, nutty ale. De-lish-us. If you're interested, try it soon - I suspect this is a winter brew and it won't be around for long!